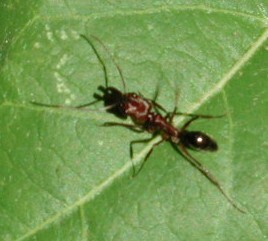 This ant was photographed using a Nikon CoolPix 990 on 24 Oct. 2002 in Phoenix, Arizona. In the shadow cast by the ant - to left of head - the mandibles can be seen. In this case they are projecting forward ... usually they are kept wide open while the ant is hunting. These ants prefer moist habitat conditions which are rare in the Sonoran Desert. Mostly they are restricted to man-made, irrigated systems and riparian habitats. Also known as trap-jaw ants, they hunt by walking slowly in an area where prey are present with their mandible-jaws wide open on a tight spring mechanism. If the palps (sensitive mouthparts), trigger hairs, or antennae sense a movement or contact the mandibles snap shut with incredible speed and power, piercing the prey. A tiny piece of grass can be used by an observer to trip this mechanism; the surprise is that an audible sound is made by the snapping mandibles! When temperatures are cool (< 17°C) this hunting method allows Odontomachus to operate when many ant species are incapacitated by the chill.